Recently I had the pleasure of experiencing volunteering through Sar-El. For those of you who do not know me, I am from the Maritimes, and back in 1977, at the age of 21, I left Fredericton, NB for Israel. There I lived on kibbutz, served in the IDF and did social work in a development town. In 1982 I returned to Fredericton married a wonderful woman and have 3 fantastic children. Since 1982 I have visited Israel a number of times, usually once or twice per year and kept in contact with old and new friends.. In Canada I am known by the name on my Canadian Passport, Arnold. My Israeli friends are more familiar with the name on my Israeli Passport, Avraham or Avi. I was familiar with the Sar-El Program and always in the back of my mind, thought it would be an interesting experience. I think it is safe to say Sar El offers an interesting perspective that you don’t get from the usual touring. As someone who is still working, it is a little difficult for me to find the time between work and family to get away to Israel for much more than a couple of weeks at a time, so I registered for 2 weeks in October, starting the Sunday after Simchat Torah. By chance it happened to be the same time as a large group of Canadians who have been volunteering together for years. I arrived on Friday so that I could have a day or two to get over my jet lag before getting started. On Sunday morning I took the train to the airport to meet my group. They turned out to be mostly made up of retirees from Montreal who have been doing this together for years. We were made up of 27 people and although I didn’t ask everyone their age, I would guess that I was below the average age of our group. In case you didn’t guess my age from the first paragraph of this article, I am in my early 60’s. Besides the Montreal group, there were some other Canadian, American, Dutch, French and German volunteers. I hope I didn’t miss anybody. Next we were bused to our base and were assigned two young female Lone Soldiers doing their military service. One was originally from France and the other originally from Spain. My roommate was from Germany. The accommodations were much better than I had expected. It was nothing like my experience as a lone soldier, but two things were the same – the food was good and the uniforms were not quite anyone’s size. Our base specialized in medical equipment and we were all assigned to civilian work managers. As many in my group had been to the base a number of times they had specific managers they wanted to work with. I was a bit worried about the warehouse that I was sent, since none of the experienced volunteers asked to go there. My work partner from the volunteers was from Florida and although he was a little older then me, I am pretty sure we were still one of the “younger” work teams. Even our work manager was older than me. As for the work itself, it was amazing – we were putting together a field hospital. Our manager was a great guy who was also in a band where he played violin and sang. During one of our weekends off I was having supper with Israeli friends and when I showed them a YouTube video of my work manager singing, one of them immediately knew who he was. As for our work schedule, we got up early, had breakfast at 7:15, followed by the flag raising at 7:45 (when we were on time). After the flag raising we had a short walk to the warehouses and worked there until lunch at 12. Lunch was always excellent and the best meal of the day. At 1pm we went back to work until 4pm. After work we had a couple of hours to rest, shower or clean up our accommodations, followed by supper at 6pm. From 7pm until about 8 we had an evening program provided by the 2 soldiers assigned to us. After that some watched CNN or Fox News on TV, played bridge, or just socialized. By 9:30 things had pretty much quieted down for the night. Considering our group’s age I was struck the excellent physical condition and mental acuity of my fellow volunteers. Obviously Sar El keeps you physically young and your mind sharp. On Thursday we finished work at 11am, packed up, had lunch and were all taken by bus to Tel Aviv. Some of the volunteers chose to stay at an IDF hostel in Jaffa and I chose to take the train to Netanya where I was staying. We were off until Sunday morning when we all met up at the train station along with other groups from Sar-El assigned to different bases. It was a great experience and I can see why so many in our group come back year after year; some more than once per year. I would love to do it again. Our group was fantastic, and when I mentioned to one of my Israeli friends how nice they all were, their response was that it was only natural, because what other kind of person would come all that distance just to volunteer on an army base. Any one who has volunteered (especially in the Jewish Community) knows that it can sometimes be a thankless job, but at Sar-El I learned a lot about medical equipment, made some new friends and I don’t remember the last time I was thanked so much. 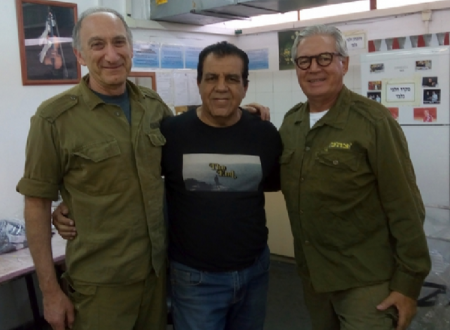 Israel has had some great achievements over the years, but as anyone who is familiar with the country knows, it is not all a bed of roses, but Sar-El does show you some of the best when it comes to Israel. The next time that Israel responds to a disaster somewhere in the world I will now have some knowledge of how their mobile hospitals are set up and might even be able to say that I worked on that particular hospital. If anyone unfamiliar with Sar El is reading this article, you should know that you don’t have to be a senior or retired to volunteer for Sar-El. The program is not dependent on age and groups range from teens on up. It is open to all religions and it is a lot more fun and enjoyable than the army. Next PostNext Our First Sar-El Experience – Robin B.